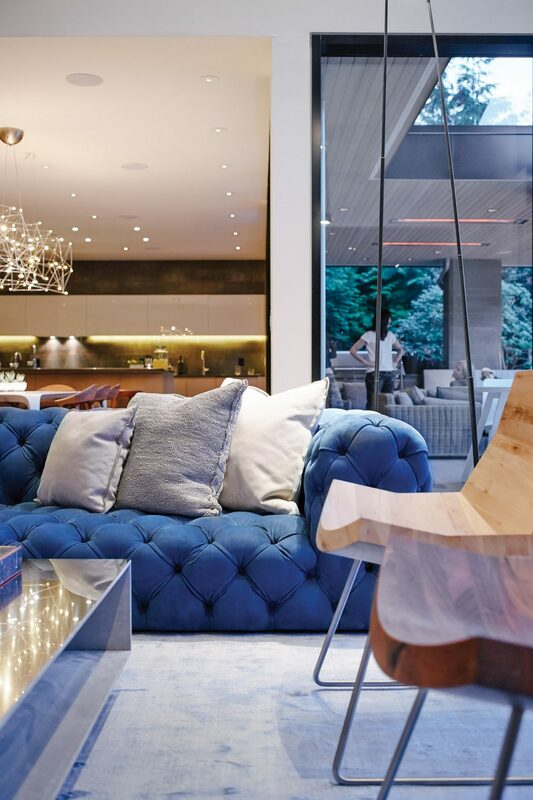 Upscale does not have to mean uptight, as demonstrated by this laid-back West Vancouver home with very forward-looking style. The 6.000-square-foot house was designed by custom home designer Craig Chevalier for a family of four that included two children under age 12 and a chocolate Labrador retriever. 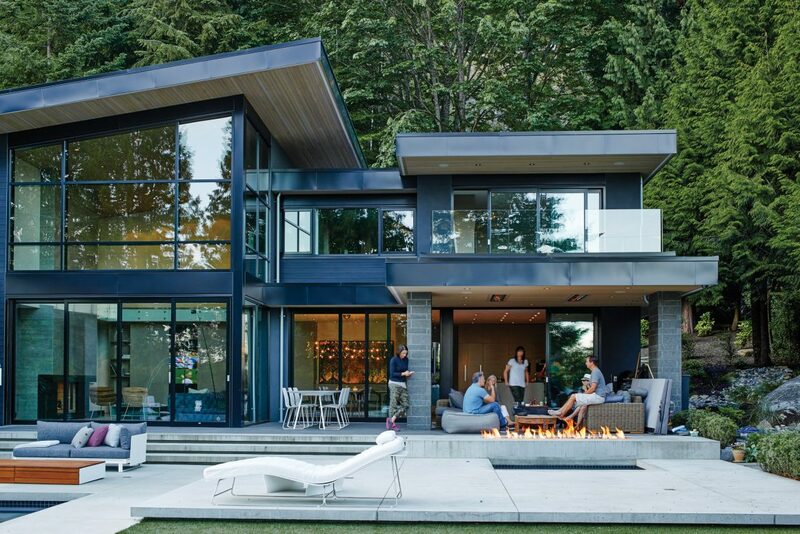 Colours were chosen to echo the home’s beautiful natural surroundings. Here the vibrant blues of the sofa and silk rug seem to reflect sunlight dancing on the surface of the backyard pool. Sofa, coffee table and rug: Baxter; fireplace surround tiles: C & S Tile; chairs: Artisan. 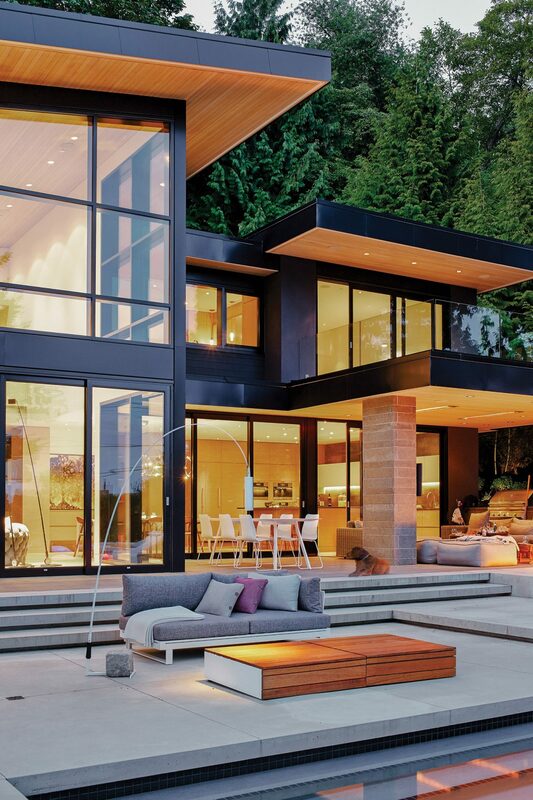 True to this style of home, the plans called for few exterior walls and many floor-to-ceiling windows on two storeys. 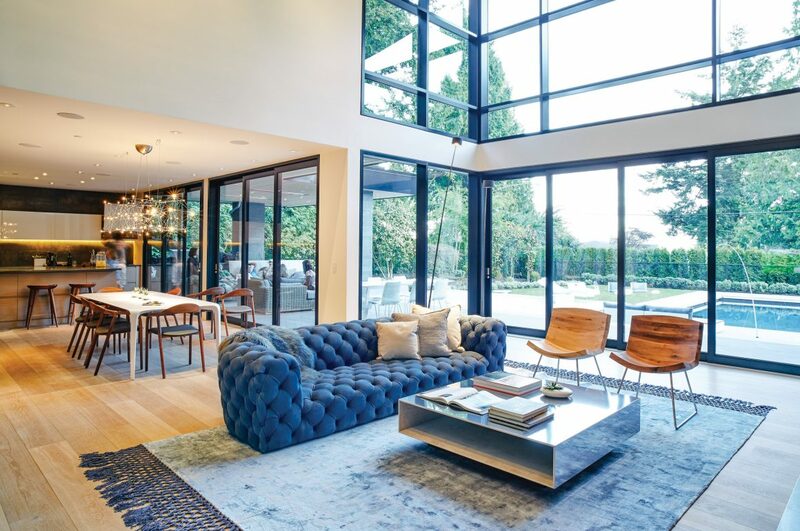 They run double high in the living room, which has soaring ceilings that range from 14 to 19 feet, and patio doors that fold seamlessly out of the way. All that glass serves to let in as much natural light as possible and enhance the sense of openness to the surrounding green space. 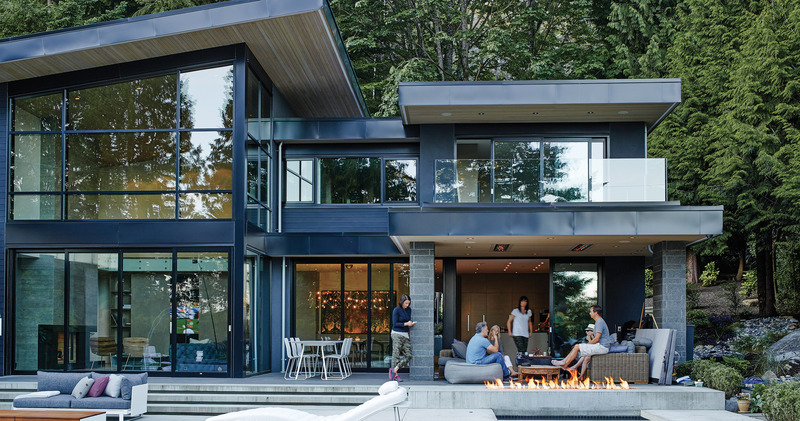 The idea was to maximize enjoyment of the inside-outside lifestyle that is becoming the norm for Vancouverites, says the designer. The designers ran light grey wide-plank European oak hardwood flooring throughout; they were given an oil finish for a natural look. All millwork is of engineered veneer in a soft, smoky grey. Walls were painted a gallery white to show artwork to best advantage. The main floor design calls for plenty of wide-open space, especially in the living room. A fireplace column, soaring 19 feet tall and open on four sides, exploits the double-high ceilings to their fullest. 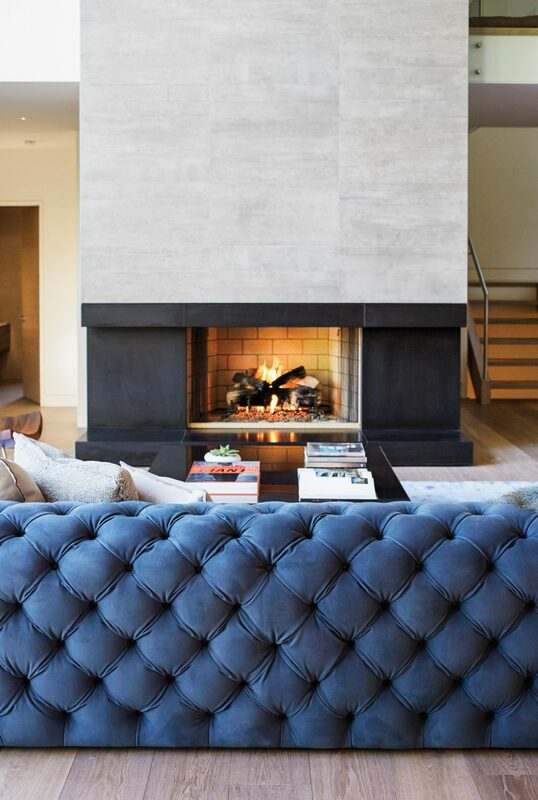 The design duo ran a slab of basalt horizontally along the fireplace base, providing a seat in front of the fire. They covered the rest of the column with tile that emulates board-formed concrete so well, most people are fooled and surprised that it’s porcelain, says the designer. “But once we had the bones of West Coast style – clean and tailored lines, natural materials with beautiful finishes – it was time for some fun, eclectic touches,” Leccacorvi says. For instance, the living room’s curvaceous and tufted blue sofa, 10 feet long, is intended to be a showstopper. Under it lies a blue silk rug with distinctive hand-knotted trim, which Leccacorvi notes reflects light and has a watery wave-like effect. A mirror-finish coffee table is flanked by two purposely mismatched side chairs, designed by Karim Rashid for the Artisan brand. 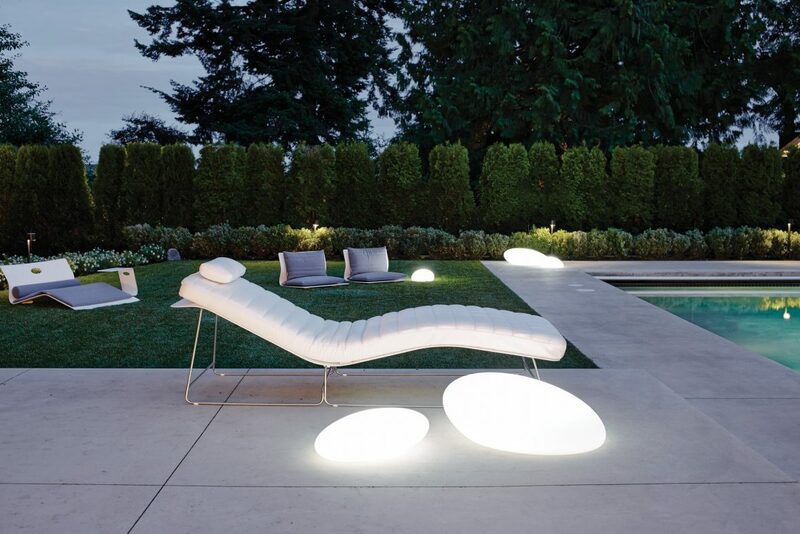 Minimalist lighting fixtures provide special effects by night while remaining unobtrusive by day. Dining area chandelier: Quasar; dining table: B&B Italia; bed: Twils. Original artwork in dining room and master bedroom by Tanya Slingsby. 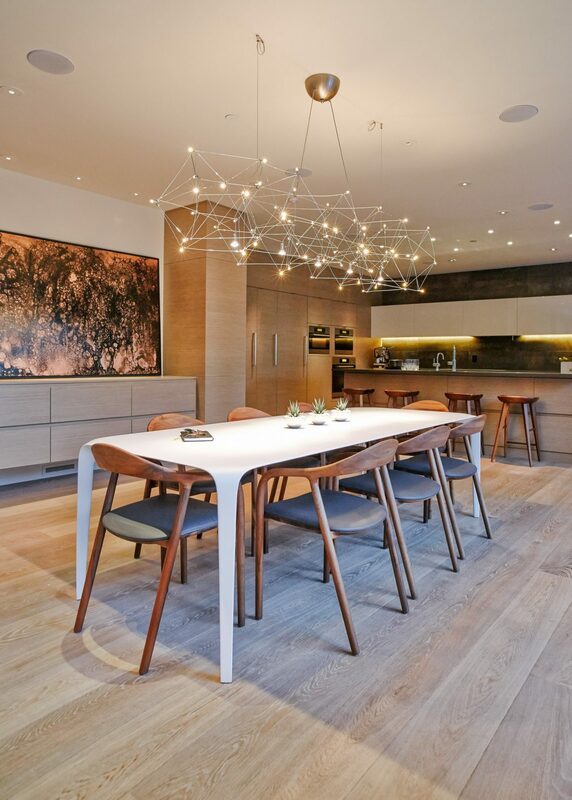 The dining table’s slightly sprawling legs also have a ludic touch. 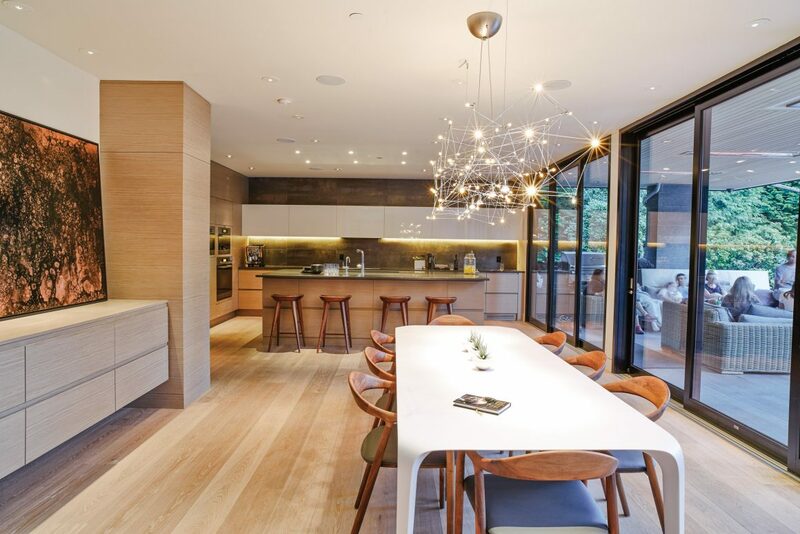 Overhead hangs a light-weight metal chandelier with myriad lights, inconspicuous by day, spectacular by night. In a minimalist interior, what few decor elements there are need to be both special on their own and in synergy with what’s around, the designer notes. 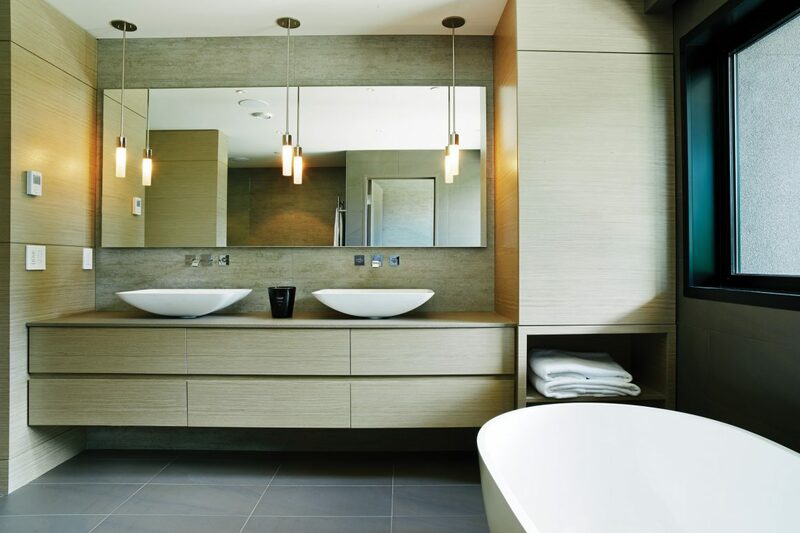 Serenity reigns in the master bathroom, thanks to a muted, neutral palette and mix of textures. 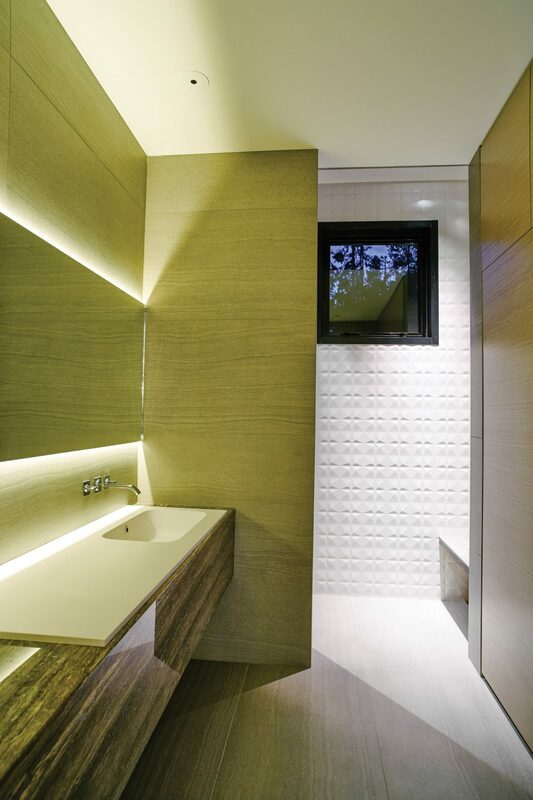 On the wall behind the sink, the luxe look of board-form concrete was recreated with the use of more practical lookalike porcelain tiles. 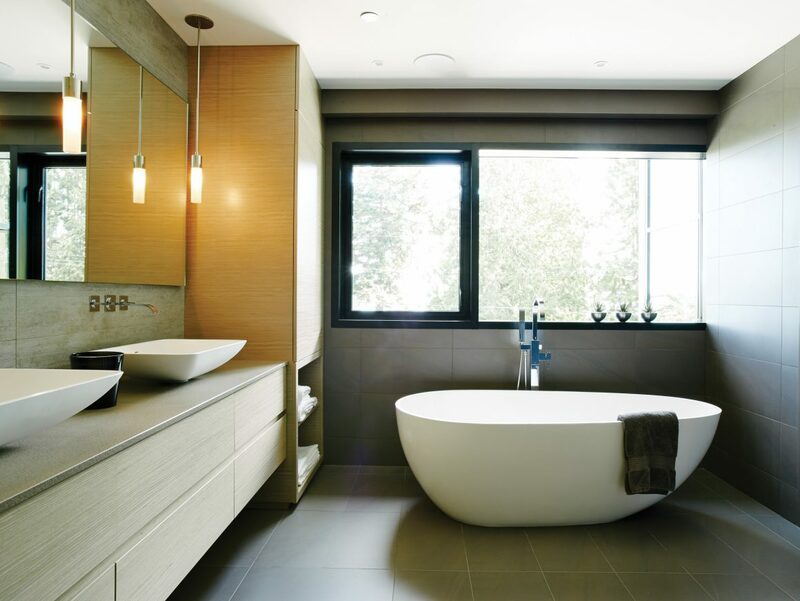 Wall tiles: Porcelanosa; floor tiles: Stone Tile; faucets and vessel sinks: Blu Bathworks. The home has four bedrooms, one on the main floor, three on the upper. Each has an ensuite, with a bonus bathroom on the basement level. The master bedroom decor is surprisingly spare, as per the homeowners’ request. 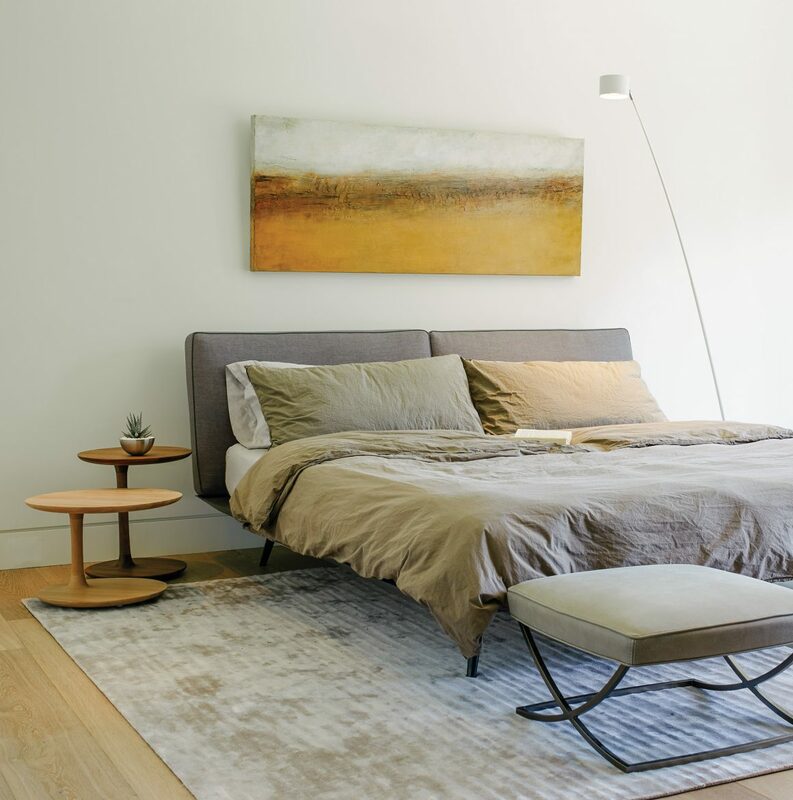 A painting by Vancouver artist Tanya Slingsby hangs over a low-slung leather-upholstered bed with naturally rumpled linen bedding. 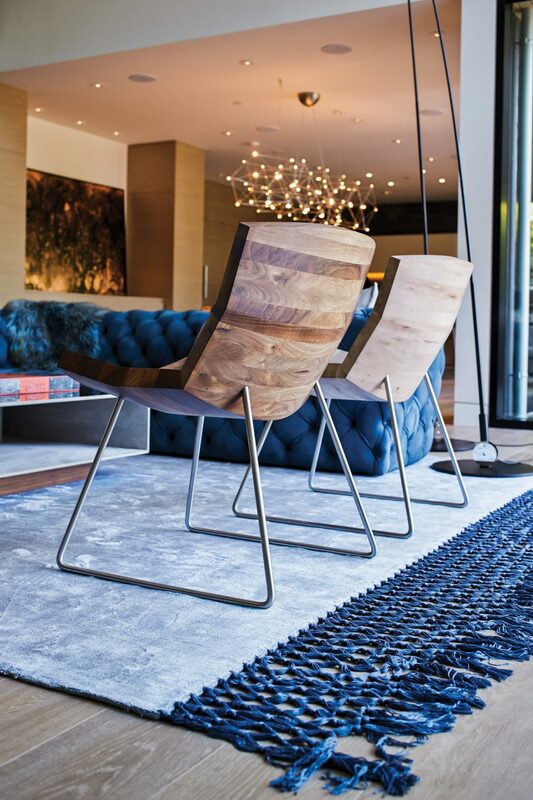 Two wood tables with unusual and curvaceous shapes stand on one side, a floor lamp on the other. 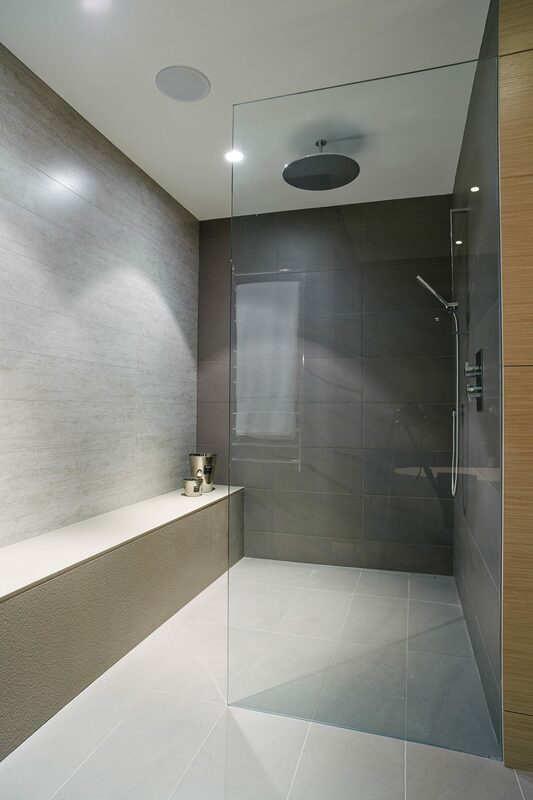 The powder room is also the changing room for the swimming pool. 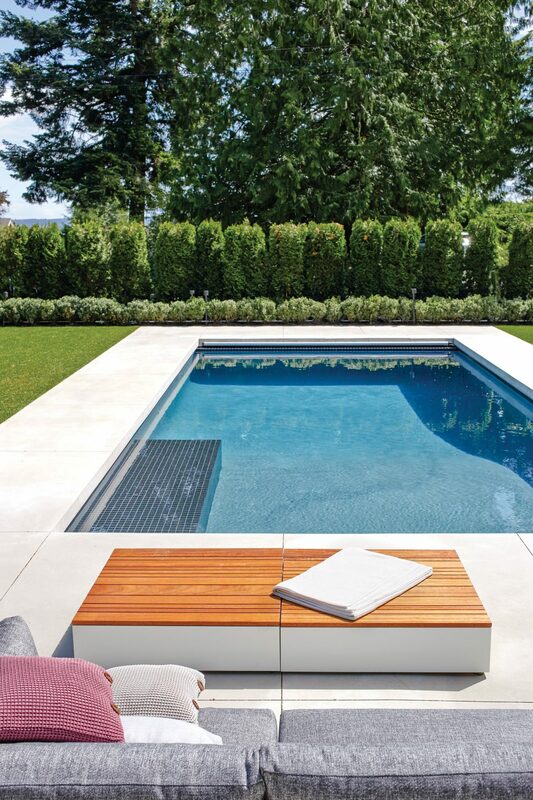 The homeowners’ love of minimalism and easy living carried over into the backyard pool area. Outdoor furniture: Viteo, courtesy of ROOM8.